Last month Google Chrome released version 68. 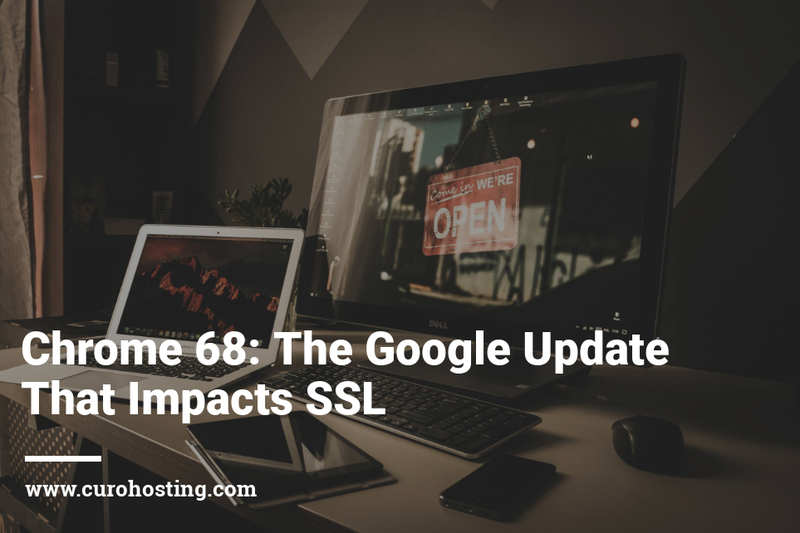 This update had a significant impact on websites that are still not using SSL certificates. An estimated 56% of all internet users experience the “not secure” warning on sites they visit because they have not yet installed an SSL certificate installed. While SSL is not a new thing, and the Chrome update has been in place a few months now the pressure is still very much on – to make sure your site is SSL secure. So what is SSL you may ask? Have you ever noticed the green padlock in the address bar of individual websites and wondered what it meant? That green padlock is an indicator that an SSL certificate secures the site you’re visiting. Websites with SSL use HTTPS and therefore encrypt any data entered on that website. This includes credit card information, names and contact details. So, it’s pretty significant. Websites using an SSL certificate has always been of high importance to Google. However, in more recent years they have been pushing for a more secure web browsing experience for their users and in 2014 Google ran an “HTTPS Everywhere” campaign and later announced that SSL was a ranking factor. Having websites secured by an SSL is a priority for Google. They are aiming to secure the web itself and protect unsuspecting website visitors. Google rates SSL certificates with such high importance because it often results in higher conversion rates, faster loading speeds, enhanced data protection and overall improved user experience. Have you been caught out by the Google Chrome update? It’s time to get one! Whether you are a large corp or a small-time blogger SSL security is now the standard. For the everyday web user, SSL security is now something they expect to see. With the latest Chrome update Google has now made it even more evident to us which websites are “not secure”, and we should, therefore, avoid them. After all, the primary aim of this update is for safe sites to be displayed usually and for non-HTTPS websites to stand out. Firstly check to see if your site is SSL secure. You can do this clearing your cache and then visiting your website in Google Chrome. It will tell you if this is secured. If you do have an SSL, it is worthwhile making a note of the expiry date to ensure there is no time where your WordPress site is listed as “not secure”. It is not too late to install an SSL certificate on your WordPress site. There are a variety of SSL certificates to choose from. You can read our comparison between free and paid SSL certificates to help you decide which is best for you. Also, you can find out everything you need to know about SSL certificates. CuroHosting offers clients an SSL certificate in the form of Comodo Positive SSL; this comes with full installation and configuration. If you have any questions about installing an SSL certificate on your site, feel free to contact our WordPress experts for some advice.